Typical of Australian art is an appreciation of contrasting styles. 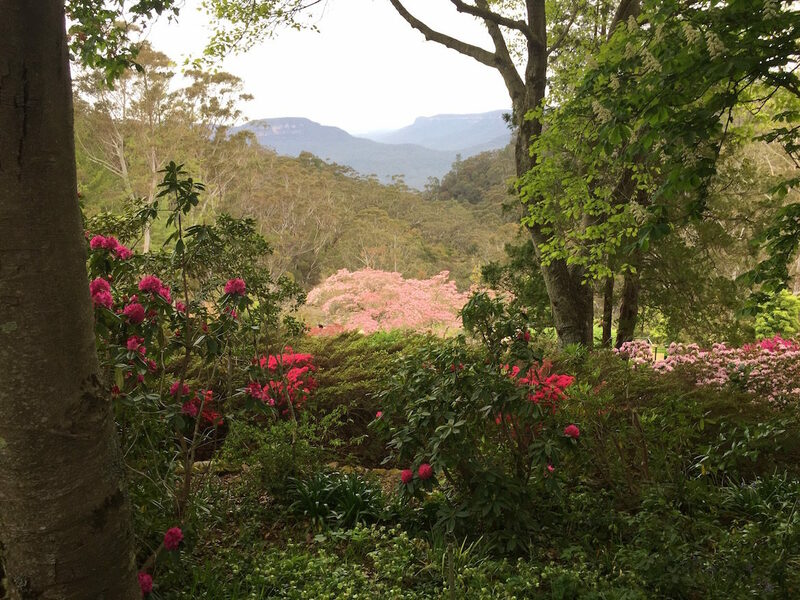 At Everglades Gardens, it’s mainly European flowers and trees, but at some places in nature, and in botanic gardens, such as at Mount Tomah, you can find stunning native plants, in particular, the waratah, floral symbol for the state of New South Wales. I first attended the Leura “Everglades Garden” at the behest of my cousin, Esther. We met as a result of family research carried out by my brother, William, who has written a book titled A Little Bit of Irish, in which Esther’s ancestors and mine—they were close back then—figured largely. 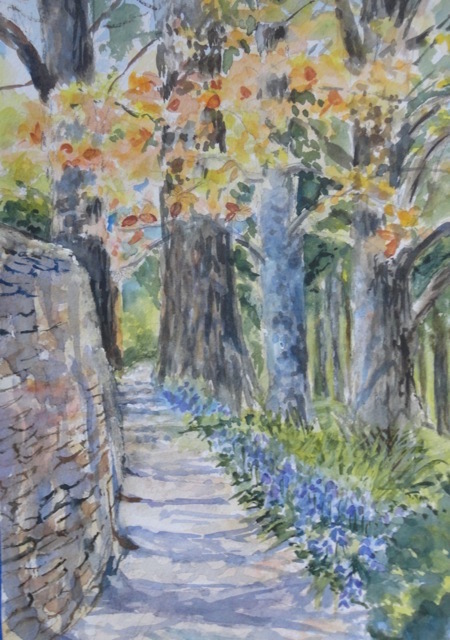 Esther is a watercolour artist who lives in the Blue Mountains and who paints landscape scenes from the gardens “en plein air”. 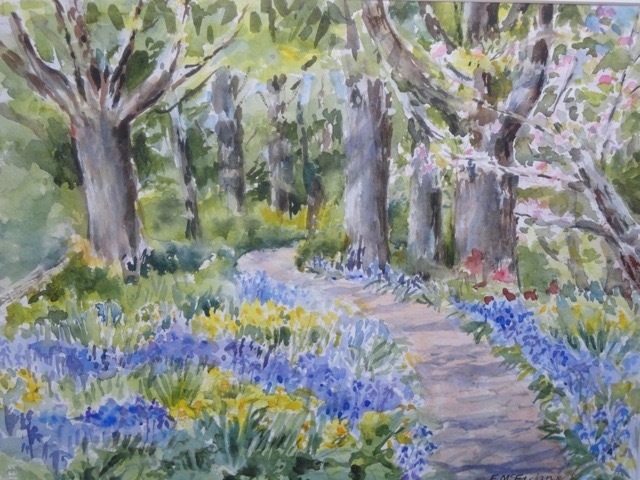 These are two of her lovely prize-winning paintings that she created in the Everglades Gardens this year and entered in the Festival Competition. 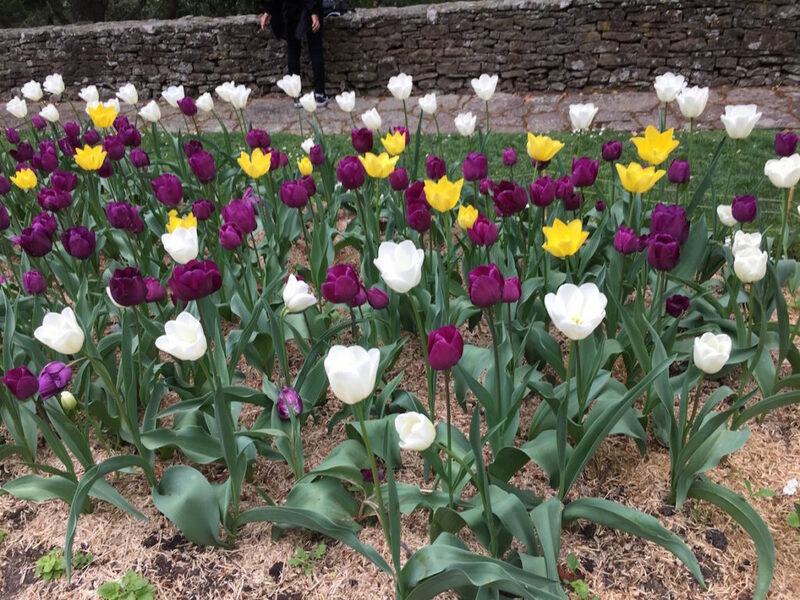 I returned by train with my husband to the Blue Mountains in the first weekend of October for the Leura Spring Festival. We viewed the gardens in full bloom. It takes two hours by train from Sydney, and costs only $2.50 to arrive at the gorgeous village of Leura. There was a Festival bus to take us around the eleven garden sights, all of them privately owned, apart from the Everglades Gardens, which are part of the National Trust. This is a world-renowned garden set against a backdrop of bush and sweeping views. In the middle of it all lies a stunning Art Deco home. It’s a lovely spot to wander, to picnic, or to enjoy a Devonshire tea. Paul Sorensen designed this European style garden that puts on its best show in spring. Set on over twelve acres and surrounded by natural bush, the garden also has views towards the Jamison valley. 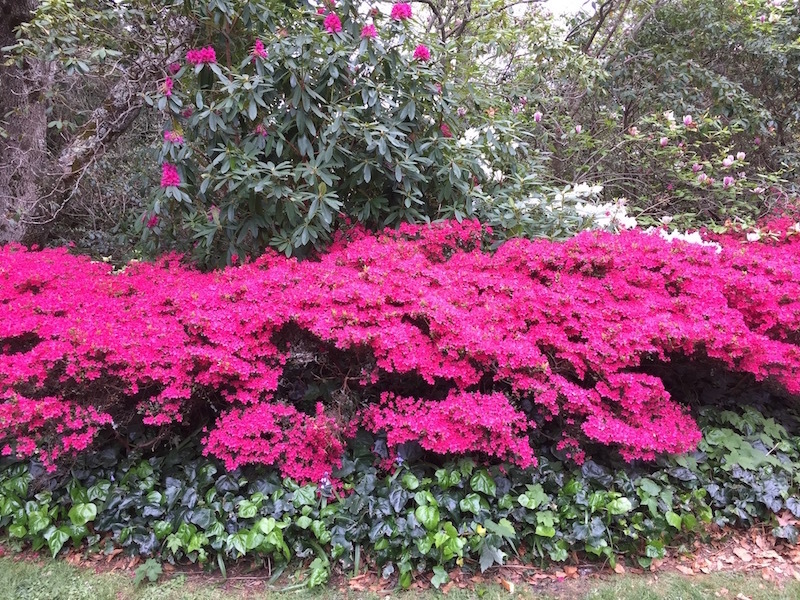 One can imagine early newcomers to Australia in the fifties and sixties, from the Netherlands and other European nations, responding with nostalgia to the beauty of the European style gardens, as well as to the bushland grandeur and the native flowers, such as the waratah and wattle that were in abundance in past years. Here are some of the photos I took at Everglades while in Leura for the spring Festival. mixing styles in australian gardensspring festival time in leurawhat is the waratah?where are The Everglades Garden?where is Leura?